Put simply, the world’s technologies are developing incredibly quickly, in a variety of ways, and it is largely positive - there are innumerable benefits that this sort of technological transformation can bring, but the way we live and work will have to change in the process. One of the biggest fears regarding the Fourth Industrial Revolution and its implications, is that people will lose their jobs, en masse. And it is a scary thought to imagine a bunch of really advanced machines and AI systems developing to the point where they replace you. WEF noted that these technological developments “...are spurring the development of new production techniques, business models, and value chains that will fundamentally transform global production” (Readiness for the Future of Production Report, 2018). 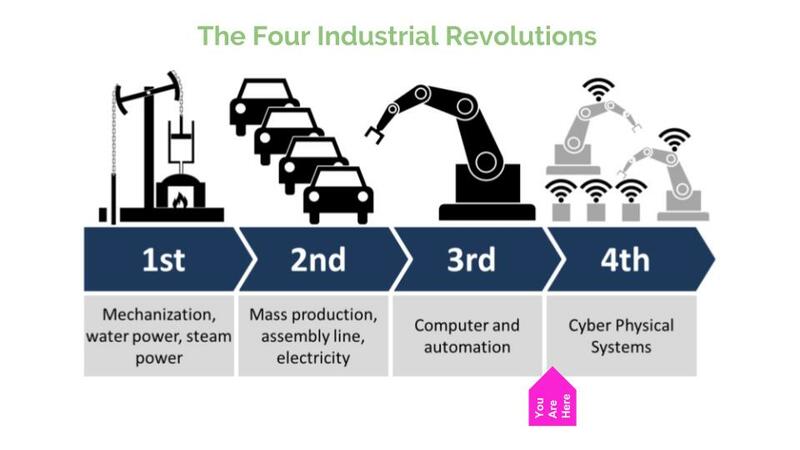 In other words, the Fourth Industrial Revolution does mean massive change in terms of jobs and, more generally, the way global production is conducted. Seems obvious, right? Prepare for the Fourth Industrial Revolution as we see it on the horizon, and make sure your country and citizens are skilled enough to benefit from it instead of suffer. Unfortunately, no one is there yet and “no country has reached the frontier of readiness, let alone harnessed the full potential of the Fourth Industrial Revolution in production” (WEF, 2018). With technological development moving as quickly as it is, it’s imperative for countries to adapt and change in ways that not only welcomes this progress, but take full advantage of the opportunities that will come with it. This means investing time, money and significant energy in reskilling people to leave replaceable jobs behind, and become invaluable in their differentiation from machines. So, we know what the Fourth Industrial Revolution is, what it’s implications are and what we should be doing, but what is really happening around the world? People are scared. Scared about the fact that “disruptive technological and socio-economic forces threaten to swiftly outdate the shelf life of people’s skillsets and the relevance of what they thought they knew about the path to social mobility and rewarding employment,” and this is in part because of a lack of “willingness to make a reasonable investment in reskilling that will bridge workers onto new jobs” (WEF, 2018). This needs to change because employers simply cannot maintain hiring an entirely new workforce each time a new skill set is required. Rather, there needs to be an increased focus on “reskilling and human capital development.” Workers should also be actively engaged in developing their skill-set, as it removes job insecurity to a large degree, and opens the door to a range of job and career opportunities that are likely more meaningful, stable and fulfilling. Who wants to do a job that a machine can do, anyway? The world is changing, and The Fourth Industrial Revolution is bringing of the most transformational developments to our lives. Moving forward, people, employers and policy-makers alike need to realise that success in the Fourth Industrial Revolution lies in the individual’s ability to both differentiate from and complement machines, working with them rather than in opposition to them. WEF notes that a key facet of The Fourth Industrial Revolution is the uncertainty of it, specifically because we are not even aware of what skills will be essential in the future.